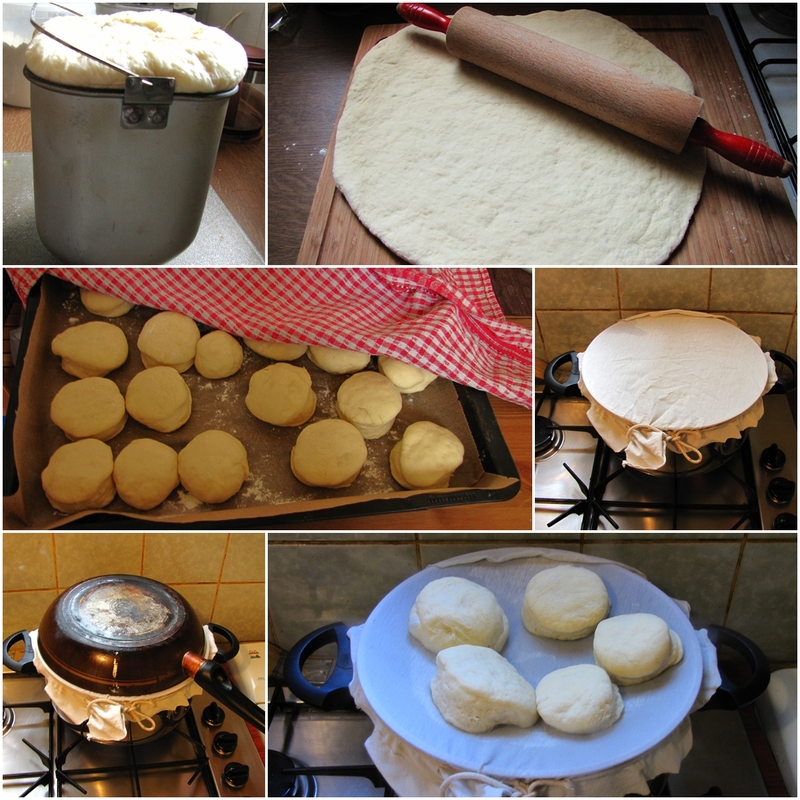 I've already shown you pictures of yeast dumplings. Today I will show you how to make, cook and serve them. This dumplings were a wish of my granny this week. Long story short: once a week, Saturday or Sunday I am having lunch with my granny. I've started this tradition more than a year ago after she turned 91. I thought it would be a nice idea to spend some time dining with her and serve her once a week something different and home made which is far away from that meals on wheels she gets during the week. 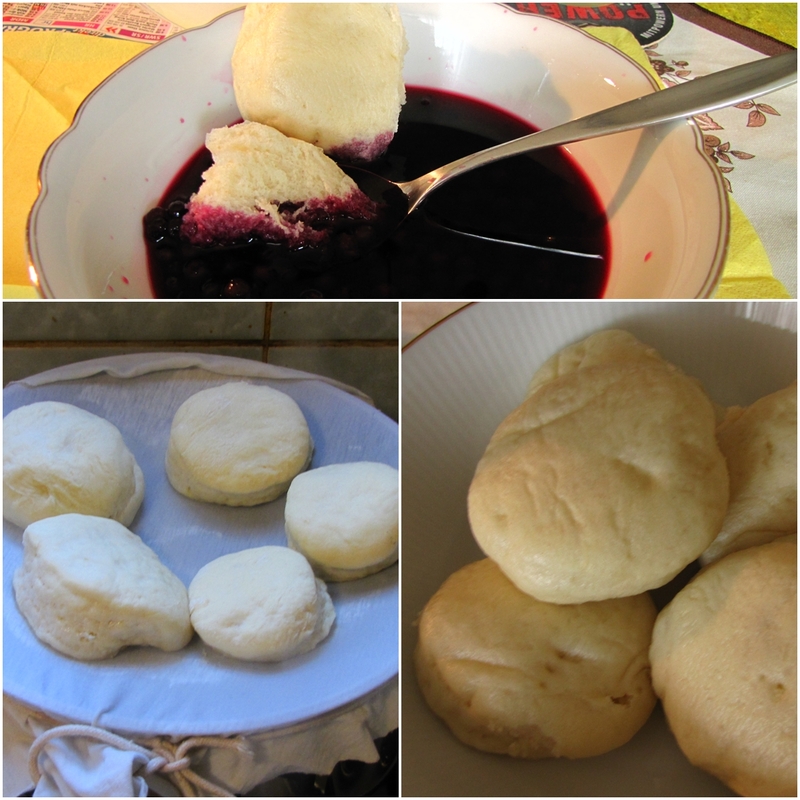 This dumplings are known as Germknödel (Bavaria), Dampfnudeln (Germany wide), Buchten or Buchteln (Silesian Germans and Silesians) or Knedlicky (Czechs) in all the South German regions as well in Bohemia, Moravia (Czech Republic) and Silesia (Poland). There are different ways of preparing and serving them but they are very similar. 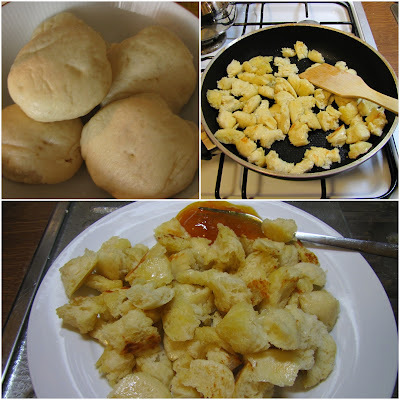 Some eat them with meat and sauce instead of potatoes some serve them with compote or melted butter. In my family all three ways are known and practiced but I prefer to eat it the way my mom's family does it - with huckleberry/blueberry compote. So here we go. First of all you need to make a yeast dough. Take 3/4 oz (about 20g) fresh yeast, 3 tablespoons of sugar, and 1 1/2 cup (300 ml) of milk. Mix it well in a BIG bowl until the yeast is mixed well with the milk and sugar. Add one egg, 3/4 oz (30 g) of melted butter (the butter must not be hot anymore!!!) and a pound (450 g) of flour (all purpose). Mix it, cover the bowl with a clean kitchen towel and leave it for about 1,5-2 hours in a warm place to rise. If you have a bread machine you can put the ingredients the way I wrote and choose the dough programme. It should take about one hour and a half until it's ready, the machine makes all the job for you. After the dough is risen, roll it out with a rolling pin to the thickness of about 1 1/2 inch (ca. 3 cm). You'll maybe have to add one or two spoons of flour is the dough is too wet, you will know how much to add to roll it out without having a gluey dough on your hands. Take a glass and cut out the dumplings. Put them on a with flour covered chopping board or large baking pan. Cover them with the kitchen towel and allow them to rise for about 30-40 minutes or an hour. Cook the dumplings covered with a pan or a big bowl ON STEAM (see the pictures) for about 5 minutes on every side. It took me about 10 minutes to put the ingredients to the bread machine, then after the dough was risen about 10 minutes to make the dumplings. If you have some dumplings left keep them covered and you can also toast them and serve with butter and marmolade or roast them gently with some butter and serve them with marmolade. They're also very tasty the next day.